A belated spin-off of Steven Soderbergh’s Ocean’s caper comedies (minus the earlier films’ wit, chemistry, and style), Ocean’s 8 could learn a thing or two about brevity and craft: It belabors the basic plot points Ocean’s 11 dispatched with a single cut or smirk, the result a hacky imitation of the series’ glitzy pizzazz. The first of the Soderbergh films, a loose remake of an old Rat Pack vehicle, is an eminently re-watchable heist flick, with George Clooney as Danny Ocean, the gentleman con who assembles a stellar supporting cast to rob three casinos owned by his ex-wife’s new guy; it’s zingy, clever, and even poignant, with Las Vegas as a perfect backdrop for its misdirection, showmanship, and high stakes. To some extent, it’s a movie about taking the studio’s money: the ringleader as director alter ego, drawing obvious parallels between the magic act of the heist and the craft of the film. Directed and co-written by Gary Ross (The Hunger Games, Free State Of Jones), Ocean’s 8 feels impersonal in contrast, squandering some capable actors and a potentially fruitful setting—Manhattan’s star-studded annual Met Gala, deep in the world of art, haute couture, and their associated deceptions—on a caper with no suspense, internal tension, or stakes. A bald, plodding rehash of the first movie’s opening scenes introduces Sandra Bullock as Debbie Ocean, the heretofore unmentioned scam-artist sister of the reportedly deceased Danny. Framed by her slimy art-dealer ex, Claude (Richard Armitage), she’s spent the last five years behind bars, plotting a heist of her own: to steal the Toussaint, a $150 million Cartier diamond necklace. With the help of her best friend and partner-in-crime, Lou (Cate Blanchett), she assembles a ragtag crew: Rose (Helena Bonham Carter), a démodé fashion designer who owes millions in back taxes to the IRS; Tammy (Sarah Paulson), a suburban homemaker with a long rap sheet; Constance (Awkwafina), a skateboarding pickpocket; Amita (Mindy Kaling), a jeweler; Nine Ball (Rihanna), a hacker. The unofficial eighth member of their team is an unwitting accomplice: the glamorous and self-obsessed movie star Daphne Kluger (Anne Hathaway), the honorary chair of this year’s Met Gala, whose celebrity status will convince the French snoots at Cartier to lend the Toussaint out for one night from the vault where it’s been kept for half a century. Per the formula, Ocean’s 8 only reveals the exact scope of the plan after it’s in motion; all we know for sure is that it involves manipulating Daphne into borrowing the Toussaint for the Gala, switching it out with a fake, and possibly exacting revenge on Claude. (However, considering that their preparations for the big night involve cracking the Met’s security and infiltrating the catering company, the red carpet, and the offices of Vogue, they might as well steal the whole museum while they’re at it.) What’s missing (among other things) is an angle, some way of relating the audience’s point of view to the perpetration of the heist. Apart from a fun early sequence in which Debbie swindles her way into a new wardrobe and a luxury hotel suite, Ocean’s 8 rarely locates the pleasure in the crime, and its airless genre mechanics are done no favor by Ross’ undexterous direction, which often leaves the movie coasting on star power. Lacking his predecessor’s panache, he occasionally overcompensates with Venetian-blind transitions that are more vacation-video than kitsch-cool. 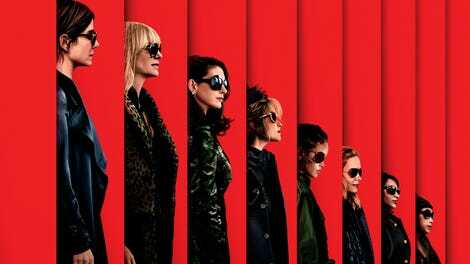 The all-female team is smaller than in the previous Ocean’s films, but many of the characters are indistinct and inconsistent, and the Gala heist itself is confused and repetitive. Somehow, it involves three different trips to the bathroom—an accidental bit of symbolism in a protracted climax that strains to keep its audience’s attention. As in the earlier movies, the plot is filled with self-reflections, but they’re mostly unflattering: the counterfeit diamonds; Debbie’s visits to her brother’s grave; the third-act introduction of an insurance company employee (James Corden), flown in to provide comic relief in a film that is already supposed to be a comedy. Instead of a diversion, it offers distractions.